As of April 26th, 2018, a bill has been introduced into the U.S. Senate to stop the sale of F-35 fighter jets to the Turkish Regime. S.2781 - A bill to limit the transfer of F-35 aircraft to Turkey, was introduced by Senators James Lankford, Jeanne Shaheen, and Thom Tillis. The bill is currently referred to the Committee on Foreign Relations. At this same time, the U.S. House has introduced a provision in the National Defense Authorization Act (NDAA), independent of the Senate bill, that prohibits the Defense Department from executing “the delivery of a foreign military sale for major defense equipment under Section 36 of the Arms Export Control Act to Turkey, until the report is complete." 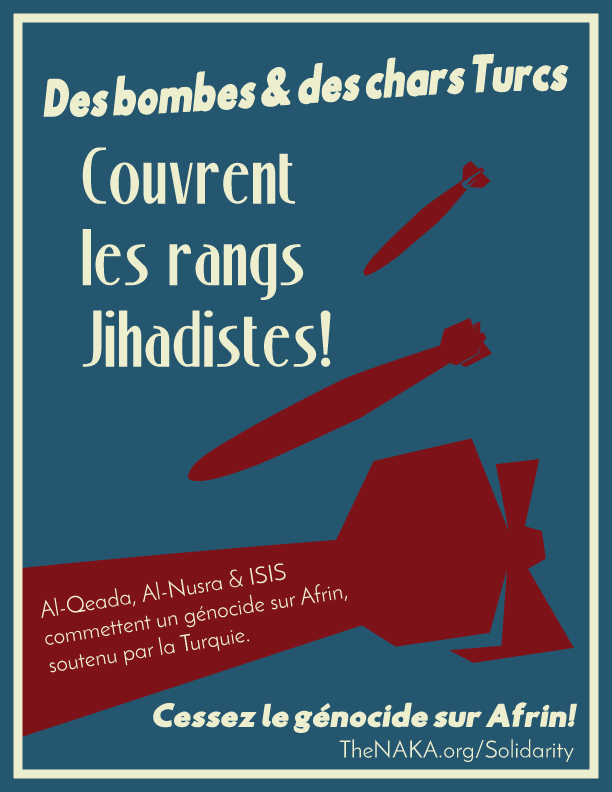 NAKA is working on a public-facing campaign to support grounding jihadist jets of the Erdoğan regime. If you'd like to help contact legislators or get the word out about this legislation, volunteer today. The Federation is among few reliable allies of North America in the region. The Federation’s coalition of democratic forces, the Syrian Democratic Forces (SDF), has liberated northern Syria from ISIS. The SDF fight for democracy and it’s in line with North American interests and core values to continue to support our allies and our friends. Recep Tayyip Erdoğan is the current “president” of Turkey. Since he seized the Turkish state, he has imposed genocidal attacks and extreme repression against Turkey’s Kurdish population, in the occupied Kurdish region, known as Bakurê Kurdistanê, which constitutes about 20% of Turkey’s population. Since Erdoğan seized the presidency, he has used a questionable coup to arrest political opposition, more than 110,000 people, and to advance a referendum for sweeping dictatorial powers, and to target anyone who opposes his tyrannical rule as “terrorists.” This wolf is the boy who cried “terrorist,” while supporting actual terrorists. Since the Syrian civil war began in 2011, Turkey has cooperated closely with the Salafi jihadist Ahrar al-Sham, whose leaders were al-Qaeda members in Afghanistan. Turkey lent support to jihadists from al-Qaeda’s Syrian affiliate, Jabhat Fatah al-Sham (formerly the al-Nusra Front). Until recently, Erdoğan’s state allowed foreign fighters through its borders to join ISIS in Syria, who were often found with Turkish passports and clear material support from Turkey. 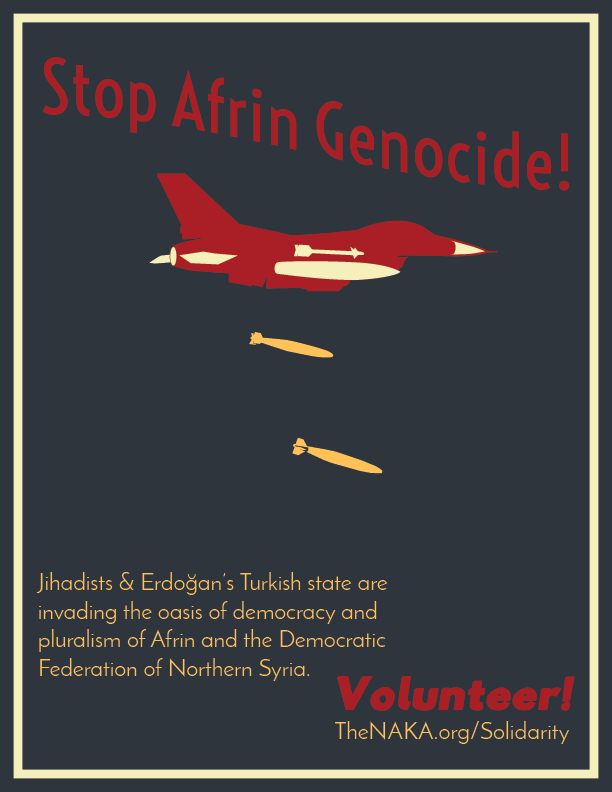 Now, Erdoğan is using the same jihadist groups to wage a war on Afrin, which could end the same as the massacre as we saw in Şingal, when Salafi jihadists of DAESH murdered, enslaved, and raped the Yazidi people. Erdoğan’s operation has already committed numerous war crimes, human rights violations, and has predominantly killed civilians in indiscriminate attacks. There is a Kurdish saying that the Kurds have “no friends but the mountains.” Let’s be the friends beyond the mountains, as there couldn’t be a more clear friend for secular, democratic values against tyranny.